At first, James Howlett, now known as Logan, struggles to keep up with the work at the quarry and finds an enemy in the immensely overweight camp cook, Cookie Malone. But within a year, Logan begins to exhibit a grittiness that earn him the admiration and respect of both Rose and Smitty. Logan soon learns to hunt on his own, taking down deer with only a wooden spear. Logan also shows a remarkable level of compassion, perhaps passed down from his father, and shares the spoils of his hunts with a grieving widow in the camp. As Logan pushes his past behind, he begins to take after Smitty, drinking, smoking and even talking in the same manner. One night, Cookie picks a fight with Logan and beats him to a pulp. Smitty drops Cookie with one punch and admonishes Logan for not standing up for himself. Logan flees in a panic, trying to hide the fact that his claws popped out during the fight. Running into the woods, Logan finds himself face-to-face with a savage wolf who seems to accept Logan as a fellow feral beast. As time passes, Rose and Smitty begin to fall in love, while Logan, blissfully unaware, takes to running with the wolves and killing deer barehanded with the pack. At the quarry, the camp has come to view Logan as a tremendously hard worker who digs like ‘a wolverine.’ Cookie, jealous of Logan’s popularity, trims the fuses on the dynamite that Logan has just learned how to use. The result is a cave-in at the mine that kills five miners, but Logan is found alive under the rocks with his body shielding a young boy. The following day, Smitty gives Logan a book on Japanese samurai, all the while suspecting that there is more to Logan than meets the eye. During the funerals, Logan catches Cookie stealing from the cabins and finally summons the courage to deck Cookie. Excited by his victory, he runs to tell Rose, only to find her in an embrace with Smitty. Enraged, Logan pops his claws, races to the forest and challenges the alpha wolf. Within minutes, Logan has defeated the wolf and is accepted by the pack as their new leader. Meanwhile back in Alberta, the elder Howlett, on his deathbed and regretting his earlier actions, requests that the now full-grown Dog find his grandson, James. When Rose accepts Smitty’s proposal for marriage, the couple decide to move away from the quarry, and to raise money for their train fares, Smitty enters a bare-knuckles competition. Logan takes the engagement especially hard for he had dreams of spending his days with Rose and enters the competition as well, earning the nickname of ‘wolverine ‘ for his ferocity during his first few bouts. However, Dog tracks Logan down and secretly gives brass knuckles to his next opponent and nemesis, Cookie Malone. Even at a disadvantage, Logan makes mincemeat of Cookie setting up the final bout between Logan and Smitty. To everyone’s surprise, Logan easily manhandles Smitty, but at the last moment, Logan throws the fight, allowing Smitty to collect the money to start a new life with Rose. As Smitty and Rose prepare to leave, Logan is attacked by Dog, who, with his height and size advantage, beats Logan senseless. Logan notes, after being dropped by Iron Fist with one punch, that he has not been hit like that since he was a kid. As Dog stands over Logan, he mockingly mentions James’ father, causing Logan to lose control and knock out Dog. Logan pops his claws to kill, in his mind, his father’s murderer, but Rose runs to stop him and impales herself on his claws, dying instantly. Devastated, Logan flees for the wilderness and joins the wolf pack, ignoring Smitty’s pleas to return. Rose’s diary chronicling the events of James Howlett’s earliest days is destroyed in a fire as Cookie Malone ransacks Rose’s quarters looking for valuables. With that, Wolverine: The Origin came to an end. And what a disappointment it turned out to be. Filled with one-dimensional characters and cheap melodrama, this ‘epic’ tale seemed more intent on trying to fool readers than entertain them. And the over-the-top superhero art styling of Andy Kubert clashed in stunning fashion with the turn-of-the-century tone of the story. Worse were the shockingly inconsistent character depictions, shifting from the childlike features of frail James Howlett in one panel to his demonic visage with rippling muscles in the next. Simply put, this was not a story that needed to be told. And that it was so at odds with what we knew of Wolverine’s earliest days, I can only surmise that misdirection and shock value was deemed more important than entertainment and continuity. Sabretooth reveals that Logan’s mutant healing ability not only works on his body, but also on his mind. In other words, Logan’s mind was able to block out especially painful memories, such as the deaths of his father and Rose, which would explain why Logan had little or no memory of these events. In a near-death experience, Logan realizes that he does, in fact, block the memories of especially traumatic events, and when he has a vision of Rose, he does not recognize her. Logan carries credentials from the Nassau Police Department, identifying himself as Detective Jim Logan. While the ID is undoubtedly a forgery (or a professional courtesy), it is interesting that Logan unwittingly chose the name he was given as a child. A familiar scent in San Francisco’s Chinatown sets off a flood of memories for Logan including “my tricycle.” Note that Model introduced the ‘three-track tricycle’ in 1883, hence prior to the events of Wolverine: The Origin. Quentin Quire, a young mutant telepath at the Xavier Institute, attacks Wolverine, psychically trapping Logan in his past where he is called James. In a telepathic conversation with Jean Grey, Logan reveals that he has been having flashbacks of a woman with red hair calling him James, screaming for help. Though Logan believes these might be memory implants from Experiment X, it shows that he is slowly remembering his past. In referencing Wolverine’s past, Fantomax drops the name of James in passing, showing that he knows more about Wolverine’s past than Logan does. In fact, Fantomax seems to imply that the Weapon X program knew quite a lot about Logan’s past. 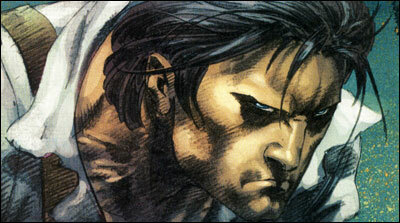 Fantomax reveals details from the Weapon Plus files, such as Logan’s real name listed as James Logan. Prior to Logan ‘s involvement into the Weapon X program, the head of the program, the Professor, has a file with the name, James Howlett. Logan specifically remembers confronting a wolf with his bone claws. This is a clear indication that Logan remembers the events of Wolverine: The Origin. After the reality-changing events of House of M come to a close, Logan finds that he remembers his entire past. With his memories intact from the events of House of M, Wolverine dreams of Rose. Enduring a near-death experience, Logan has visions of his childhood as James Howlett and the death of Rose at his own hands. As part of the President of the United States daily intelligence briefing, Tony Stark (Iron Man) includes a dossier of Wolverine that reveals his name as James Howlett. After an especially bloody confrontation with Deadpool, Logan flashes back to the moment he killed Rose with his claws. When Professor Xavier probes Wolverine’s mind to help him regain his memories, Logan has a flash of running with the wolves. Wolverine dreams of his past several times shortly after the events of Weapon X: killing a deer with his claws as leader of the wolf pack while preparing for a mission as Wolverine and twice of Rose, first when he meets Heather shortly after Weapon X and secondly when Heather talks to him after a particularly nasty mission. Wolverine remembers running with the wolves. On an especially emotional birthday, Wolverine has a hallucination of Rose. 4 Comments on "003: Days of Whine and Roses"
Just wanted to say I lost interest in the character, but only came back to him because of the Origin book. 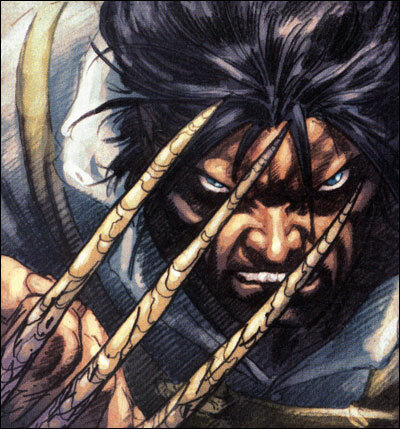 I blame the memory implants and over told Weapon X stories, that made me see Logan as one dimensional. But it was the Origin mini series that made me see Logan from a different perspective.